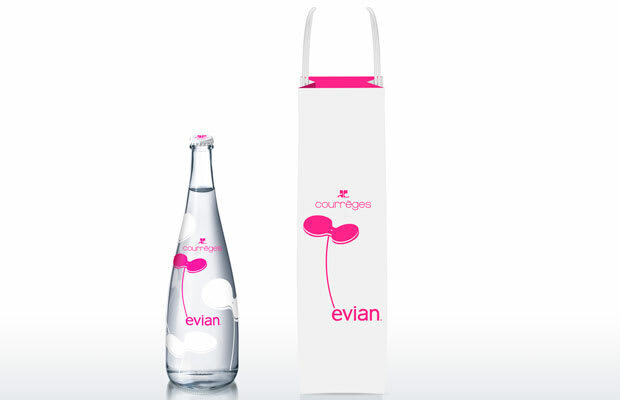 evian has brought in French fashion designer House of Courrèges as the latest collaborator the brand&apos;s limited edition bottle series. Following in the footsteps of Paul Smith, Courrèges shares its emblematic white and pink flower as backdrop to evian&apos;s iconic glass bottle. The flower emblem was launched in 1967, just one of many keynote designs by Courrèges over the company&apos;s 50 year — the firm is also responsible for kickstarting the trend for miniskirts. Bottles will be available at select resturaunts and hotels from November and online at evian. Click the thumbs for details and images from the House of Courrèges archives.